9/11 the day that changed the world forever. But what was it like to live 9/11 on ground zero New York?. 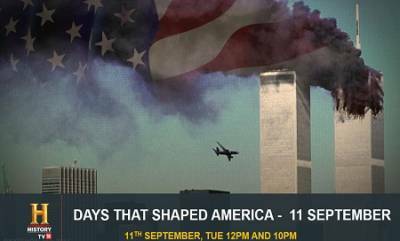 HISTORY TV18 pieces together the day as it unfolded through the eyes of those living it with ‘Day That shaped America-9/11’ airing 11th September, 2018 at 12pm & 10 PM. The largest terror attack in our nation's history left images seared into our conscience that will never be forgotten. But for those caught in the middle, the memories are as strong today as they were in 2001. Hear the harrowing experiences of a trader who worked in the World Trade Center, a firefighter, a Port Authority officer, an ER doctor, an NYPD rescue worker, and a news reporter who were at Ground Zero, as well as a Pentagon contractor, an Airfone operator communicating with Flight 93, and the head of FAA operations as they experienced the tragic unfolding of a day none had dreamed possible. Catch the two hour gripping docudrama of Day that shaped America-9/11 only on HISTORY TV18 on 11th September, 2018.